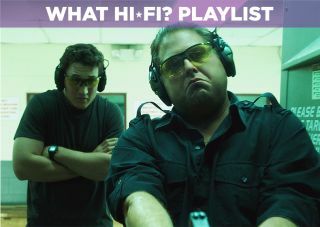 War Dogs – film review | What Hi-Fi? Two friends decide to become "gun-runners" and take on the weapons-dealing giants in Todd Philips' too-crazy-to-be-true film War Dogs. You're frustrated in a dead-end job trying to make ends meet, and a friend offers a helping hand. Before you know it, you're an arms dealer about to fulfil a $300m contract for the US Government to outfit the Afghan military. We've all been there, haven't we? It sounds stranger than fiction, but these events actually happened. Todd Philips' latest film War Dogs – based on Guy Lawson's 2011 Rolling Stone article "Arms and the Dudes" – is the story of Efraim Diveroli (Jonah Hill) and David Packouz (Miles Teller), who get in over their heads and make a ton of money in the process. First, a brief bit of history. During the second Iraq war, the Bush administration came under fire for awarding no-bid military contracts to private military firms. So it opened up the bidding process with the FedBizOpps (Federal Business Opportunities) portal, which effectively allowed any business to bid for contracts. Enter Diveroli and Packouz's AEY Inc. They get wind of a contract to supply the Afghan military, and eventually compete – and win – against the giants of the arms-dealing business, including Halliburton. War Dogs follows a long line of films about the corruption of the American Dream – a theme which crops up in films such as The Wolf of Wall Street, Pain and Gain, Lord of War, Scarface and the 2016's The Big Short. Like those films, it shines a light on a crazy story, explaining the jargon behind it. However, it stops short of providing a withering assessment of a system that was abused, offering instead a wry comment on a surreal moment in time. Hill's Diveroli feels like a cousin to his Donnie Azoff character from Wolf, a scurrilous business operator with no qualms in bending (or breaking) the laws for profit. Hill put on weight for the role and looks even less like the real Diveroli, but it helps to create a larger than life presence; his loud, halting laugh, expensive clothes and lavish lifestyle all part of his hedonistic approach. A large part of why the film works is down to his performance. The other part is Miles Teller's David Packouz, who is painted in a more sympathetic light. Packouz is initially conflicted, adopting an anti-war stance with his girlfriend Iz (Ana de Arnas), who is a welcome presence though rather underused. He's convinced by Diveroli to join him and becomes consumed with work, neglecting Iz as the (literal) stacks of money come in. It's a performance that keeps the film rooted in some sort of reality, especially when things become unbelievable. However, it can be uneven in places and for a comedic drama, it is surprising how serious the tone is in parts. That's highlighted by arms dealer Henry Girard (Bradley Cooper), whose appearance throws the film a little off kilter. War Dogs is more engaging when it's irreverent. When it gets serious, it becomes familiar and says little we haven't heard or seen before. It's a handsome looking film though, shot on location in Florida, Romania and Morocco (doubling for Iraq), which gives it more personality than we'd expect for a film of this type. The soundtrack grabs your attention, (the volume at our screening was loud), with a decent collection of songs both old and recent. It's an engaging experience on that front. At times surreal, and at others completely unbelievable, we had plenty of fun watching War Dogs, another timely reminder that greed is bad. It's a bizarre, outlandish story held together by two very good central performances. You'll either laugh at this absurd situation or shake your head as to how it ever occurred in the first place. In a summer of damp squibs, this is a good note to end on.